Raumfahrt+Astronomie-Blog von CENAP - Blog: Astronomie - E.T., we’re home Existing laser technology could be fashioned into Earth’s “porch light” to attract alien astronomers, study finds. f extraterrestrial intelligence exists somewhere in our galaxy, a new MIT study proposes that laser technology on Earth could, in principle, be fashioned into something of a planetary porch light — a beacon strong enough to attract attention from as far as 20,000 light years away. The research, which author James Clark calls a “feasibility study,” appears today in The Astrophysical Journal. 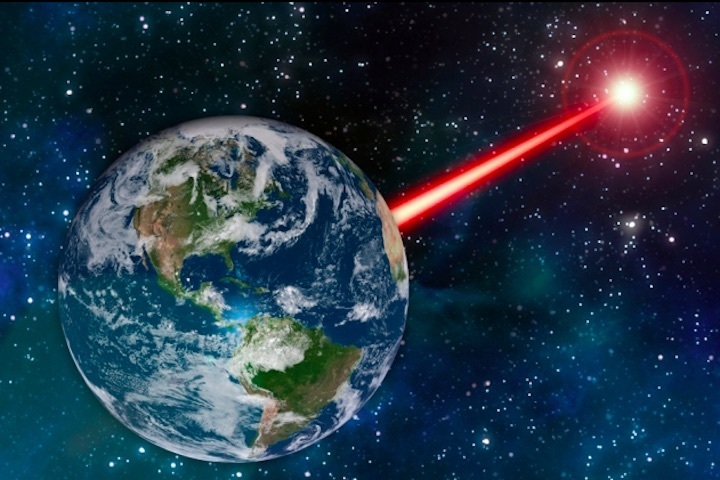 The findings suggest that if a high-powered 1- to 2-megawatt laser were focused through a massive 30- to 45-meter telescope and aimed out into space, the combination would produce a beam of infrared radiation strong enough to stand out from the sun’s energy. “If we were to successfully close a handshake and start to communicate, we could flash a message, at a data rate of about a few hundred bits per second, which would get there in just a few years,” says Clark, a graduate student in MIT’s Department of Aeronautics and Astronautics and author of the study. The notion of such an alien-attracting beacon may seem far-fetched, but Clark says the feat can be realized with a combination of technologies that exist now and that could be developed in the near term. Clark started looking into the possibility of a planetary beacon as part of a final project for 16.343 (Spacecraft, and Aircraft Sensors and Instrumentation), a course taught by Clark’s advisor, Associate Professor Kerri Cahoy. “I wanted to see if I could take the kinds of telescopes and lasers that we’re building today, and make a detectable beacon out of them,” Clark says. He analyzed combinations of lasers and telescopes of various wattage and size, and found that a 2-megawatt laser, pointed through a 30-meter telescope, could produce a signal strong enough to be easily detectable by astronomers in Proxima Centauri b, a planet that orbits our closest star, 4 light-years away. Similarly, a 1-megawatt laser, directed through a 45-meter telescope, would generate a clear signal in any survey conducted by astronomers within the TRAPPIST-1 planetary system, about 40 light-years away. Either setup, he estimated, could produce a generally detectable signal from up to 20,000 light-years away. Both scenarios would require laser and telescope technology that has either already been developed, or is within practical reach. For instance, Clark calculated that the required laser power of 1 to 2 megawatts is equivalent to that of the U.S. Air Force’s Airborne Laser, a now-defunct megawatt laser that was meant to fly aboard a military jet for the purpose of shooting ballistic missiles out of the sky. He also found that while a 30-meter telescope considerably dwarfs any existing observatory on Earth today, there are plans to build such massive telescopes in the near future, including the 24-meter Giant Magellan Telescope and the 39-meter European Extremely Large Telescope, both of which are currently under construction in Chile. Clark envisions that, like these massive observatories, a laser beacon should be built atop a mountain, to minimize the amount of atmosphere the laser would have to penetrate before beaming out into space. He acknowledges that a megawatt laser would come with some safety issues. Such a beam would produce a flux density of about 800 watts of power per square meter, which is approaching that of the sun, which generates about 1,300 watts per square meter. While the beam wouldn’t be visible, it could still damage people’s vision if they were to look directly at it. The beam could also potentially scramble any cameras aboard spacecraft that happen to pass through it. Having established that a planetary beacon is technically feasible, Clark then flipped the problem and looked at whether today’s imaging techniques would be able to detect such an infrared beacon if it were produced by astronomers elsewhere in the galaxy. He found that, while a telescope 1 meter or larger would be capable of spotting such a beacon, it would have to point in the signal’s exact direction to see it. “It is vanishingly unlikely that a telescope survey would actually observe an extraterrestrial laser, unless we restrict our survey to the very nearest stars,” Clark says.